short text messages to be transmitted to Gliese 581d, a planet outside our Solar System that, from what we can tell, might support life. It's free to register and send a comment, but the deadline is 5pm Monday 24 August 2009 Sydney time (07:00 GMT Monday 24 August 2009). 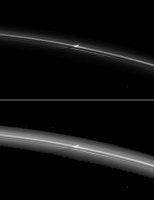 of them shows, quite distinctly, a small object piercing the F ring of debris that surrounds Saturn. There's a picture of the bifurcated ring to the left there; click it for a larger image. It looks very much as if something small has cut a path through the dust in Saturn's F ring, moving through the ring from below, and leaving a trail of dust particles in its wake. to see the Perseids. The Perseids are the dust and debris from the Comet Swift-Tuttle, and an annual August event. The moon will be fairly bright; it's a 55% Gibbous moon, so you'll want to avoid looking directly at the moon, since it's just as much a distracting source of light pollution as city and traffic lights are.